Chinese New Year is coming! This year, celebrate this important and joyous festive season with Ryan’s Grocery, the local specialty grocer. Ryan’s Grocery will be offering a variety of healthful, wholesome options: from healthier bak kwa and organic, free-range shabu shabu sets to all-time favorite cuts for Chinese cooking from the Butchery. 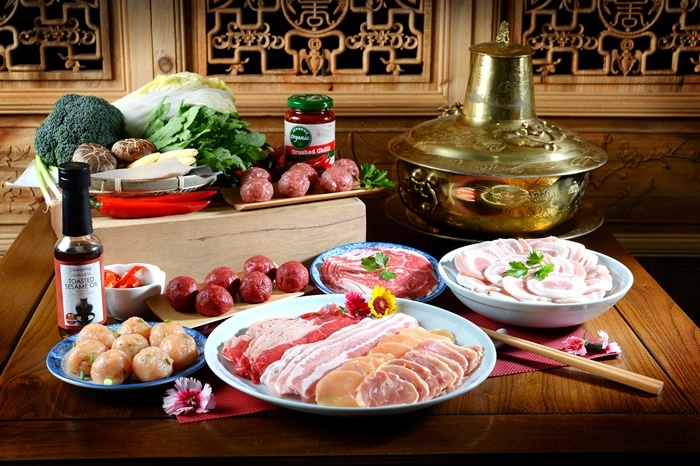 Chinese New Year is a time for hotpot which represents reunion where family and friends gather and spend time together to enjoy a meal and catch up with one and another. Ryan’s Grocery takes Lunar New Year get-togethers to another level with organic and free-range shabu shabu sets where you can enjoy a fuss-free steamboat session. Ryan’s Grocery offers Ryan’s Organic Beef Set ($118.80) or Ryan’s Pork Set ($34.80). For beef lovers, Ryan’s Organic Beef Set is the go-to choice with primal cuts such as black angus beef brisket shabu shabu and beef striploin shabu shabu, complete with a complimentary Borrowdale Free Range Pork bones and Seamore I sea bacon (worth $28.90). Ryan’s Pork Set will include of two portions each of pork collar shabu shabu and pork belly shabu shabu, with which customers can savour the quality of certified free-range Borrowdale Pork through two different cuts and tastes. The set also comes with a complimentary Seamore I sea bacon (worth $18.90). In addition, guests can also choose from an a la carte shabu shabu meat menu offering a quality list of certified free-range Borrowdale Pork ($9.60, 200g), organic and grass-fed Dorper lamb leg ($9.80, 200g), and Wagyu beef brisket ($10.60, 200g), all prepared shabu shabu style, as well as premium free-range, hormone- and antibiotic-free chicken leg coins ($7.00, 200g). Since the essence of a delicious steamboat lies in its broth, Ryan’s Grocery will be retailing premium chicken bones ($0.80, 100g), organic beef bones ($2.00, 100g) and a variety of pork bones ($1.00$1.20, 100g) essential for that nourishing and flavourful stock. Organic mushroom platters and a variety of gluten-free condiments and sauces are also available to spruce up your steamboat session for people with different dietary restrictions. Add some interest to this year’s Lunar New Year reunion dinners and steamboats with a gluten-free, vegan, low carb and high fibre alternative – I Sea Bacon. Made with 100% wild organic hand-picked seaweed from Connemara, Ireland, and France, these quality seaweed “bacon” is great alternatives for your taste buds, health and the planet! For a savoury and smoky kick, I Sea Bacon ($18.90, 75g) is not only perfect as a healthy snack straight from the pack, but can also be fried and added as a crispy topping to pasta or salads, or even stirred through any warm dish to infuse it with a bacon-like smokiness without the excess sodium and fat. A delicious array of organic vegetables from leafy greens such as locally grown seasonal Tang Oh and spinach will spruce up your steamboat. The grocer will also be retailing a wide selection of organic mushroom to choose from. Customise your session with delicious dipping sauces from the grocery’s shelf of gluten-free condiments. Whip up a sensational dipping sauce with Ayam gluten-free pure sesame oil, Meridian dark tahini and Clearspring Japanese brown rice vinegar. Jensens organic Crushed Chilli, Jensens organic crushed ginger and Kjang By Mac pork bulgogi sauce provide the perfect pairing with meat. Alternatively, a simple blend of Latasha’s Kitchen Green Chimichurri with Ayam pure sesame oil complements meat and seafood. 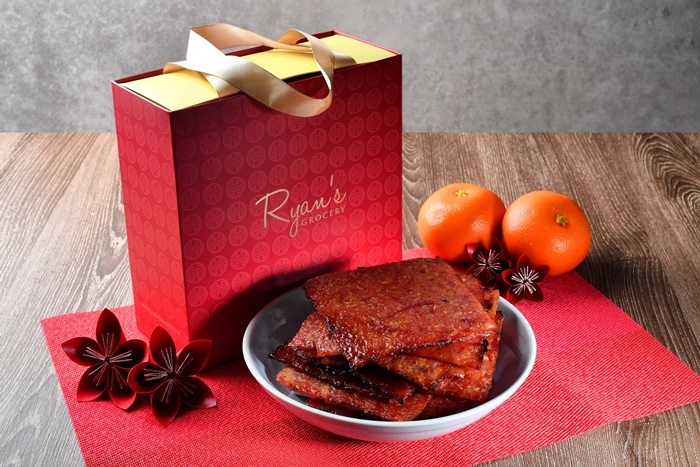 Ryan’s Grocery presents a healthier option of an all-time favourite Lunar New Year treat – Bak Kwa. Made with hormone- and antibiotic-free, free-range Borrowdale Pork, Ryan’s Premium Bak Kwa ($48.80, 500g) uses 50 per cent less salt and sugar compared to industry standards and does not contain any additives, preservatives or food colouring. Exclusive to Ryan’s Grocery, Borrowdale Pork, which is hormone- and antibiotic-free, and certified free-range from Queensland, Australia, is used for its premium Bak Kwa. Sourced from a single family-owned 10,000-acre farm, the pigs are raised in a stress-free environment with the freedom to forage, truffle and play. Great care is taken to ensure their well-being, with a balanced diet and insulated huts built on farm premises to shelter them from the harsh weather. Happy pigs translate to sensational premium pork, which Ryan’s Grocery has artfully transformed into high quality bak kwa at this time of the year for customers to indulge in with peace of mind. *Limited quantities available. Pre-order is required and collection to be made at Ryan’s Grocery on 19, 20, 26 or 27 January 2019. With so many healthier options to suit various diets and taste buds, Ryan’s Grocery is the go-to grocer for those looking to give their loved ones and friends a more nutritious Lunar New Year get-together. Visit www.ryansgrocery.com to shop for the full range of Ryan’s Grocery’s Lunar New Year offerings. Ryan’s Grocery Lunar New Year offerings are available till 19 February 2019 or while stocks last. 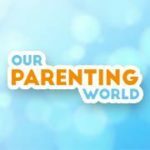 Customers who place their orders by 14 Jan 2019 will receive a 10% discount. Enjoy free delivery with every purchase of $150 and above. 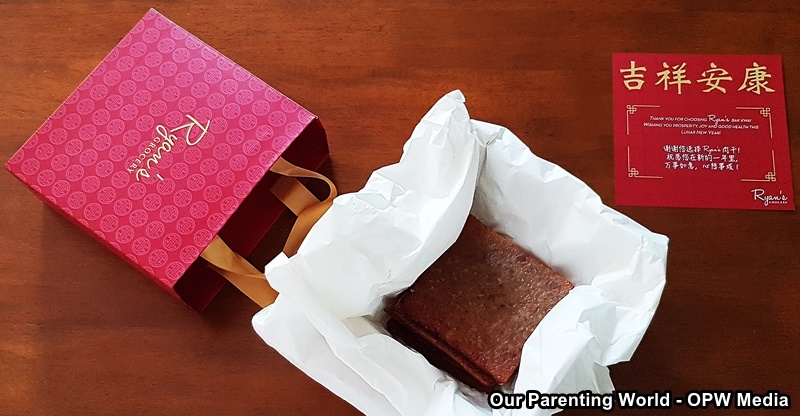 Note that only self-collection is available for Ryan’s Premium Bak Kwa and no deliveries will take place from February 4-6. Orders can be made online at www.ryansgrocery.com or instore at 29 Binjai Park. Collection timing is 9am – 6pm daily (Ryan’s Grocery is closed on 5 February). Collection on 4 February (CNY Eve) and 6 February is limited to before 2 pm. The last collection date for all CNY orders is 19 February 2019. Thank you Ryan’s Grocery for sending us this healthier and delightful Bak Kwa! It is so delicious and flavourful that we can’t stop eating it.